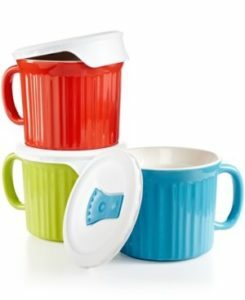 It’s a month of soups! 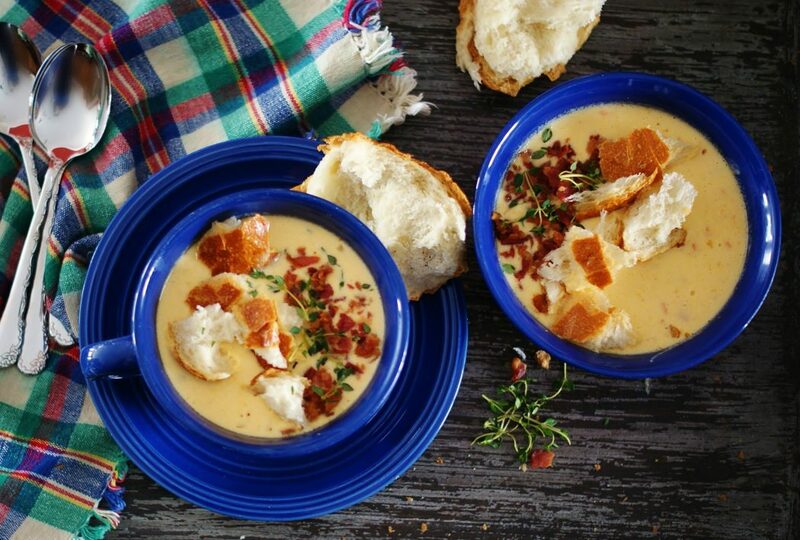 And I am just a little bit excited about all of these soup recipes I am sharing with you. They are some of my family’s tried and true favorites– suppers they always look forward to when the temperatures drop. But I have to be honest, growing up I didn’t like soup much. Ok, I admit it. I didn’t like soup at all. My experience was pretty much limited to chicken noodle and homemade vegetable soup, of which apparently my mom makes a killer pot. But all those cooked vegetables… I still cannot. I’m sorry. I know. 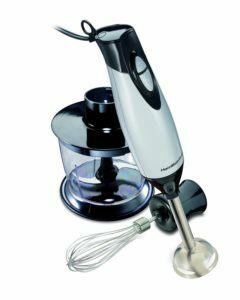 You’re wondering how we can be cooking friends now. But we can. Because cheese soup. Yes! 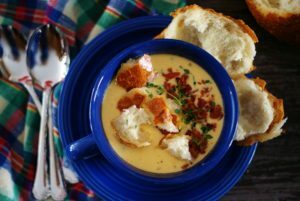 Wonderfully fabulous, rich and yummy cheese soup! 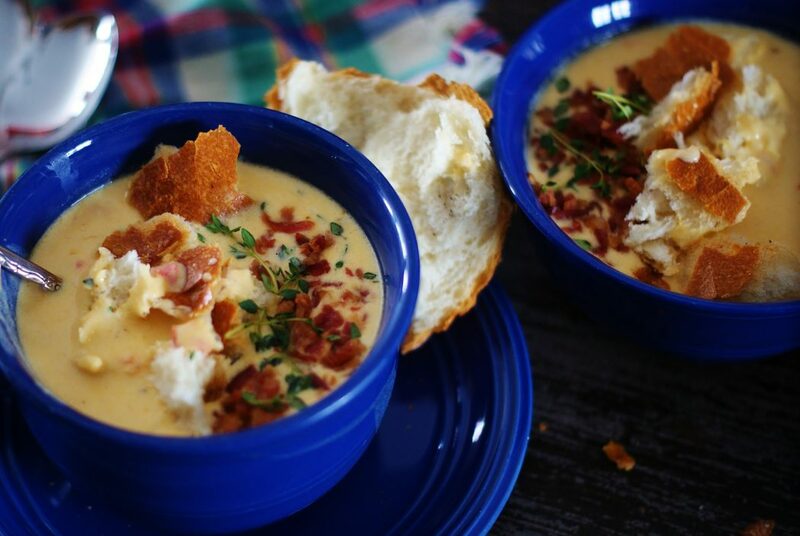 This loaded bowl of cheesy goodness is what I like to call Farmhouse Cheese Soup to be exact. Simply because anything called Farmhouse instantly becomes infinitely better than it would have been otherwise? Ummm, not really. 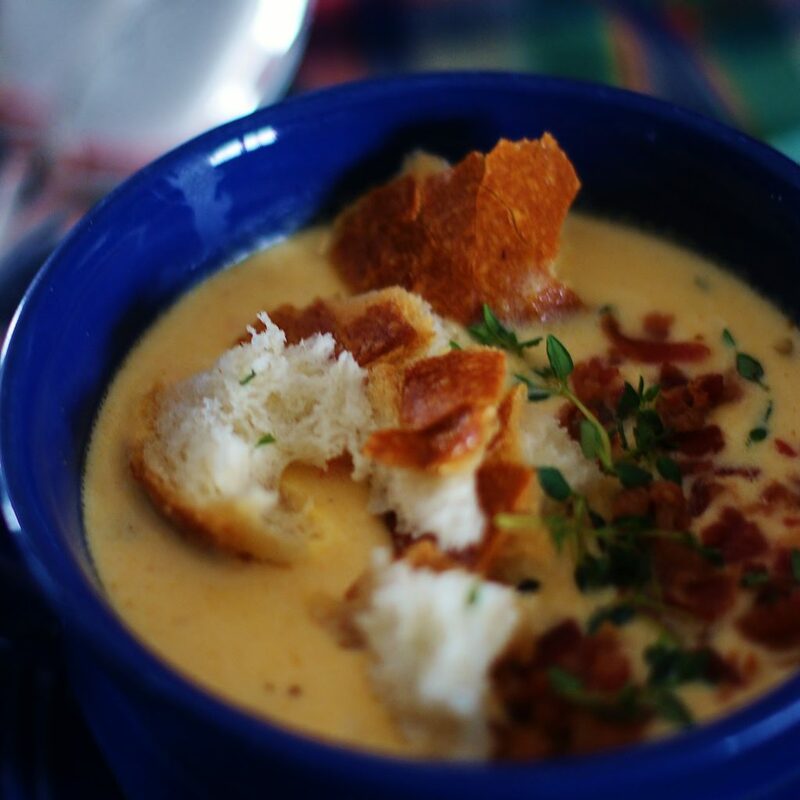 This is called a Farmhouse soup because it’s full of herbs and bacon and… and some cooked vegetables… I know. Those dang vegetables. What can I say? I grew up… A little. 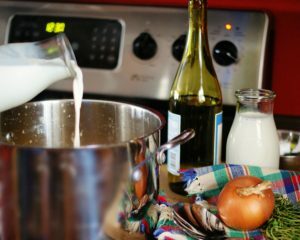 Start by making your good soup base by melting the butter in a large stock pot over medium heat. Add the onions, carrots, and celery. Cook until veggies are translucent. 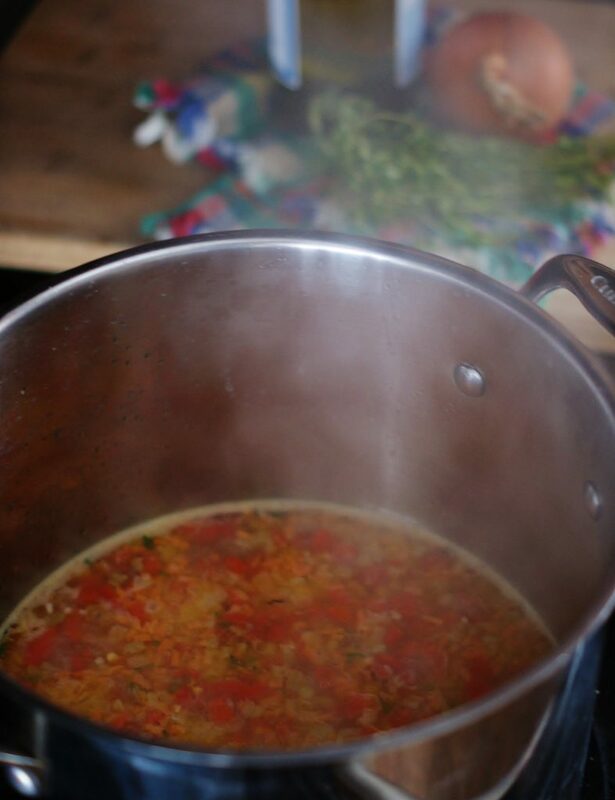 Add chicken broth and a generous 1/2 cup of diced roasted red peppers. Let simmer for 5 minutes. There are times when I use diced pimentos as a substitute. A pimento, or cherry pepper, has a similar flavor and does save you the task of dicing your roasted red peppers, since I can only seem to find them sliced in a jar. Of course, I could roast my own which I am sure would be worth it flavor-wise… but we’re not trying to over complicate things here, right? 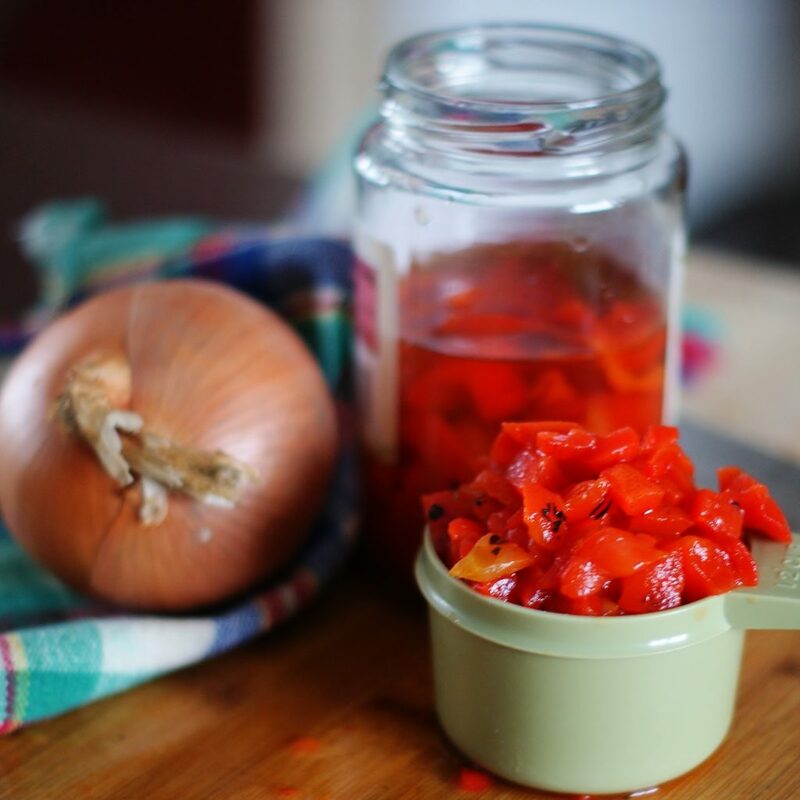 So for the sake of ease, convenience and getting supper on the table, roasted red peppers in a jar or pimentos are just what we need to move this project forward! Add the white wine and let simmer for 10-15 min. This adds a nice full flavor to the soup. 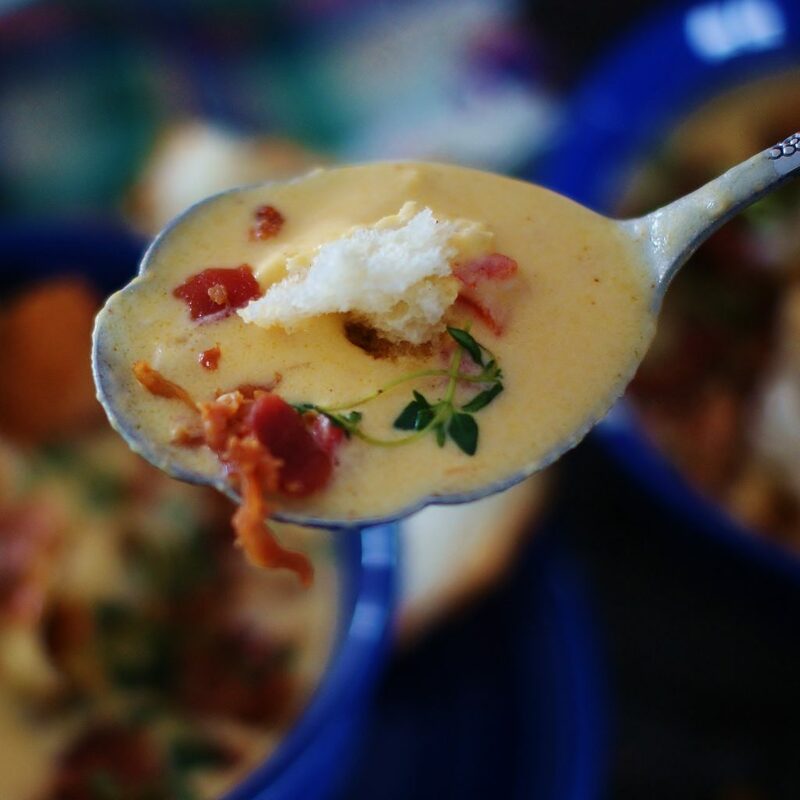 Consider it a delicate wine, cheese, herb twist on the classic beer cheese soup. 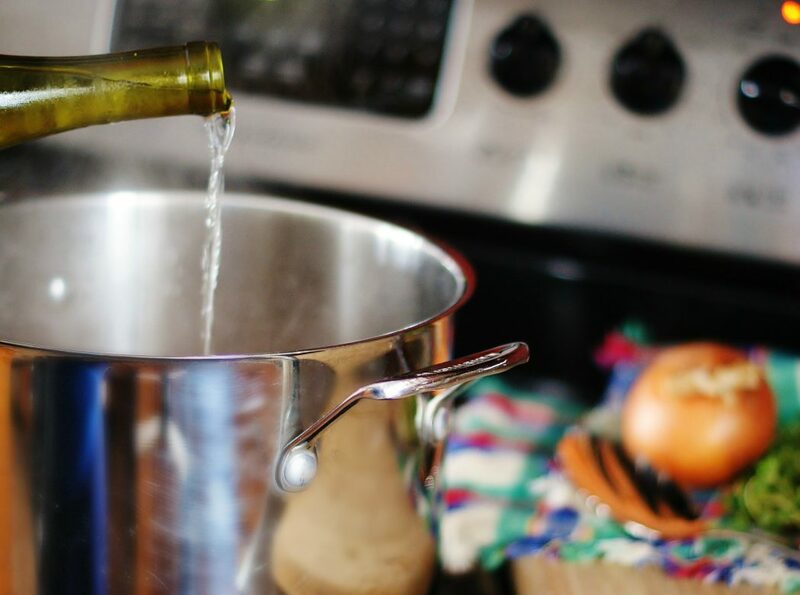 If you’re feeling iffy about the wine, don’t sweat it. Just skip it! I make this soup with and without it, and both ways deliver a big bowl of rich, comforting scrumptious-ness. Add the cheese, one cup at time. Stirring and allowing it to completely melt before adding more. 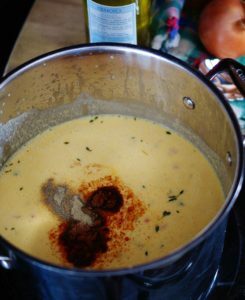 Add your spices and herbs and continue to cook on your very lowest heat setting (you don’t want your cheese and cream to separate) for another 5-10 minutes, stirring every 2-3 minutes. Now you are ready to serve! This soup is wonderful with a crusty bread and topped with bacon and a bit of extra thyme or parsley. 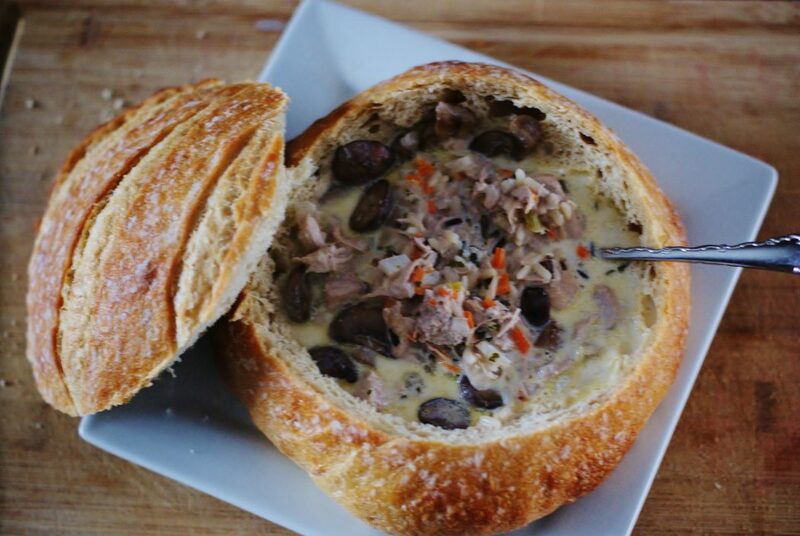 Note: 1 lb shredded or chopped chicken also makes a great add-in for this soup! 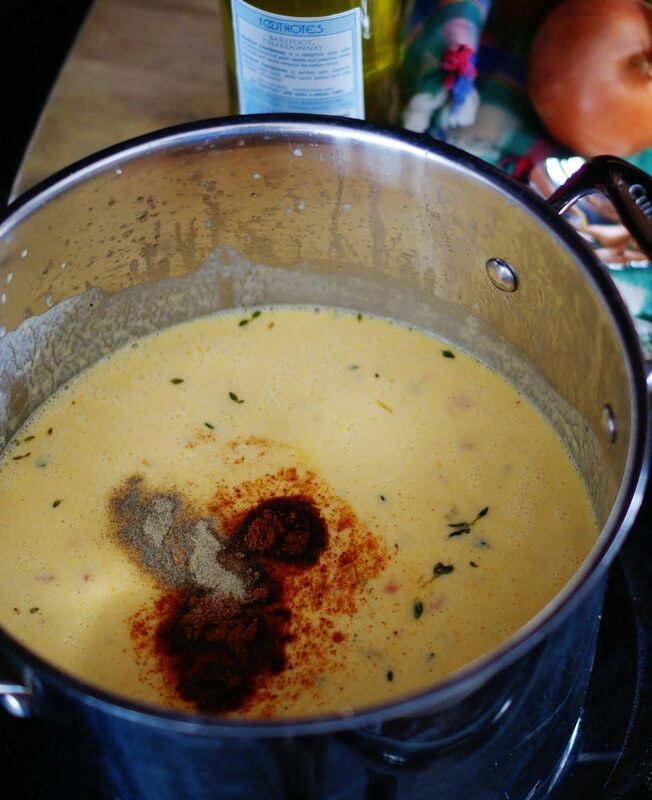 Click the pictures to shop the kitchen essentials I use to make & enjoy this soup! Want more comfort food recipes? Try these ASD favorites! 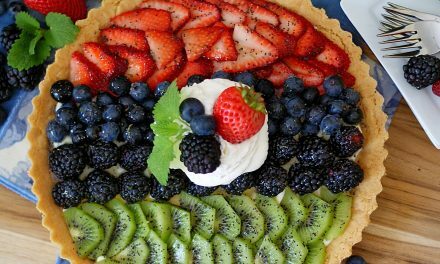 See this and other great recipes at Meal Plan Monday, Full Plate Thursday, and Weekend Potluck! 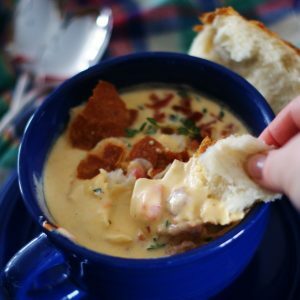 Rich and creamy cheese soup with thyme and roasted red peppers. 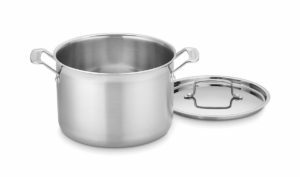 Melt butter in a large stock pot over medium heat. 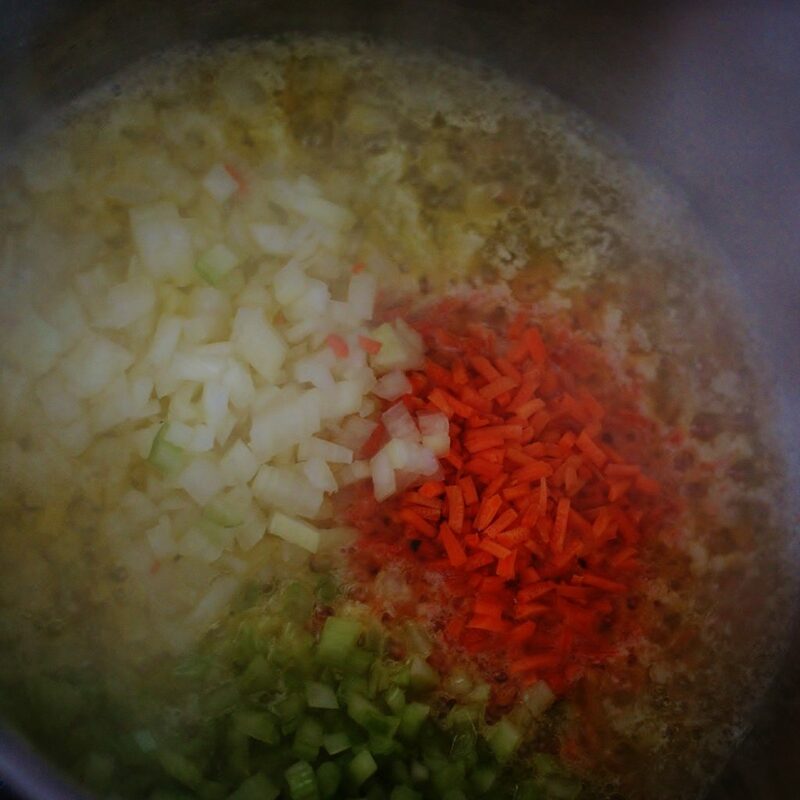 Add the onions, carrots, celery, and garlic. Cook until veggies are translucent. Add white wine and let simmer for 10-15 min. 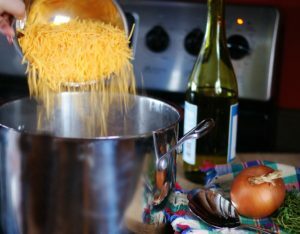 After all the cheese has been added and is completely combined, add the cream a little at a time. Stir while adding to blend well. 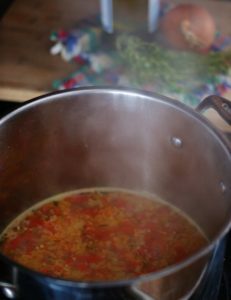 Add your spices and herbs and continue to cook on the very lowest heat for another 5-10 minutes, stirring every 2-3 minutes. Ha! We will take our wine and cheese in a bowl, thank you! Let me know how it turns out. I always love those kinds of updates! Do you have to use the roasted red peppers? While I love them, as I’m getting older, I have a sensitivity to peppers of any kind. What would a good substitute be? Thanks! I completely understand! You don’t have to use the roasted red peppers. Pimentos are a good substitute. Do they give you any trouble? Usually they are so mild, they go unnoticed by most sensitive stomachs. If you can’t do that either, I would just say skip that ingredient altogether. A great soup to share on a cold winters day! 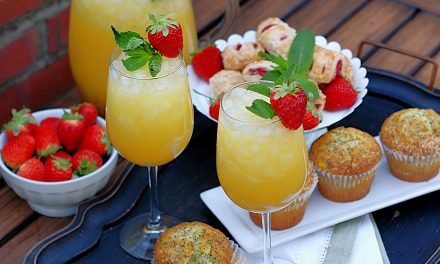 Hope you are having a great day and thanks so much for sharing with us at Full Plate Thursday and come back to see us real soon! Thanks, Miz Helen! This soup is definitely warm and yummy! I am so glad you visited! 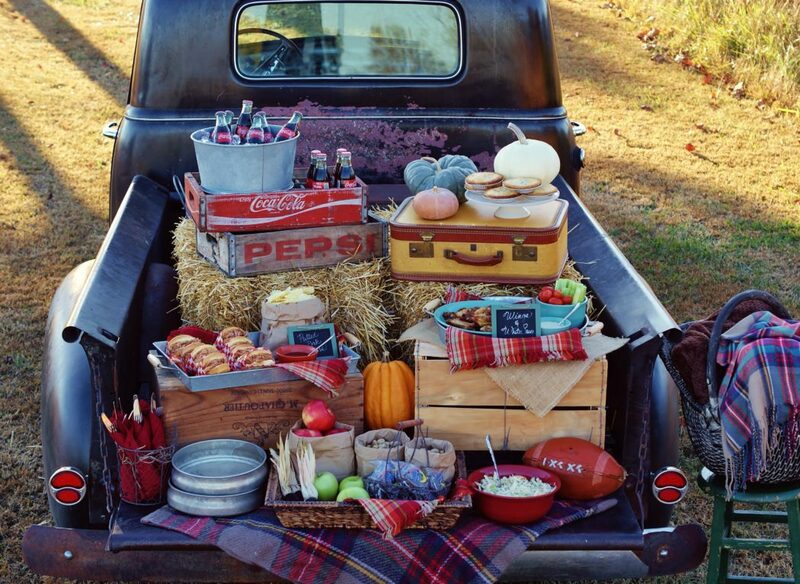 Is it possible to make this in the crockpot, do you think? I am not sure. I’ve never made it that way, and the cheddar does require a bit of babying so that the fats don’t separate!